What Happened to the Flames? 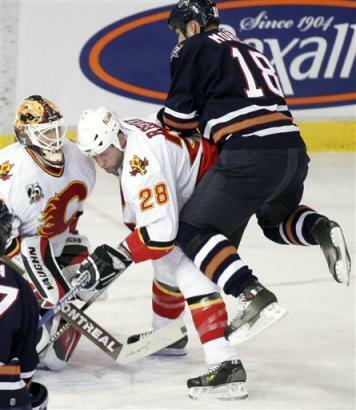 Last night the Calgary Flames started their road game vs. the Edmonton Oilers. What happened to the team that played the Sharks?? Where did they go?? Losing 5-0 to the Oilers, THE OILERS!!! That is just the worst possible thing I can imagine. They’ve played them many times before and have won against them, so why lose 5-0!?!? Really? Is it that hard? Plus the Flames were on the road, which usually gives them the advantage, but not this time apparently. Ever since the game they played against the Stars, they seem to be off their game. Why? What changed between the two?? Was it too much time off?? or did they just get soft between the games?? Any comments are more than welcome. Part of the problem, or at least I think, is that Kipper wasn’t in the goal. I’m not saying that Curtis Joseph isn’t a good goalie, but when facing the Oilers, where was Miikka Kiprusoff ?? I understand him needing a break, but seriously what was the coach thinking! !